The father of two teenagers who died at Hillsborough has told a court of the "worst moment" of his life as he travelled to hospital with one girl while her sister was on the pitch. Trevor Hicks went to the April 1989 match with Sarah, 19, and Victoria, 15. He told Preston Crown Court he warned police something was "badly wrong" as the crush developed. Match commander David Duckenfield, 74, denies the gross negligence manslaughter of 95 Liverpool fans. Mr Hicks said the two girls had been in the central pens of the Leppings Lane terrace while he had been in a pen to the side and his wife Jenni was in the North Stand for the FA Cup semi-final. He said as kick-off approached the pens seemed "very full" and it was clear there were problems. Mr Hicks said he and another man, whose son was in one of the pens, shouted up to a police officer on the gantry next to the police control box. He said: "We were basically shouting 'look, can't you see things are going badly wrong'." Asked how the police officer responded, he said he was sworn at and told to "shut my... prattle'." 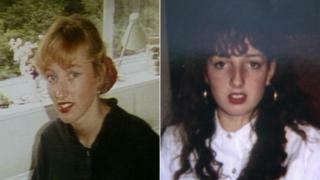 Mr Hicks said he went on to the pitch where he found the girls lying "almost side by side". He then went in an ambulance to hospital with Victoria while Sarah was still being treated on the pitch. "I had two daughters, only one with me," he said. "Obviously they both needed attention, we thought they were both alive. "The best thing to do was go with Victoria expecting that the other ambulance would follow and Sarah would be along very quickly." Mr and Mrs Hicks later identified their daughters at the stadium's gymnasium. The court earlier heard from Barry Devonside whose son Christopher, 18, died at Hillsborough. He said he "froze in fear" as he saw a crush develop in pens where his son was standing. Mr Devonside was in the stadium's North Stand, separate from his son, who had been allocated a ticket on the Leppings Lane terraces alongside friends. He said he did not see the start of the game because he was concerned at the scenes in the pens after being involved in a crush at the same fixture at Hillsborough a year earlier. After seeing two fans being resuscitated, he turned to a man with a transistor radio to ask what was happening and was told "there's two dead", the court heard. He said police lined up across the centre of the pitch but "did nothing to help the injured or dying or the removal of those who were killed". Mr Devonside told the jury: "I also saw police officers pushing back into pen three those who were fighting for their life to get out of that pen." He added he was "treated like dirt" and sent away by a policeman at the ground's gymnasium when he went to look for his son. He spent five hours visiting hospitals and mortuaries before going back to the gym, where his son's body was being stored, the court heard. Earlier the court heard from off-duty Metropolitan Police officer Steven Allen who was in pen three. He said it "was becoming obvious that there was something wrong" and waved his warrant card at South Yorkshire Police officers to get their attention and warn them. "People were shouting in agony," he said. "People were screaming. People were in pain. People were asking to be let out." Mr Duckenfield, of Ferndown, Dorset, is on trial alongside Sheffield Wednesday's ex-club secretary Graham Mackrell, 69, who denies a charge related to the stadium safety certificate and a health and safety charge.